By 1996, the club was set to build a new ballpark near the site of County Stadium, which would have a retractable roof to counter the unpredictable Wisconsin weather in the spring and autumn. It also helped to bring more fans and their families from all around Wisconsin to come to games with a practical guarantee of no rain-outs, bring in more potential revenue for the club. 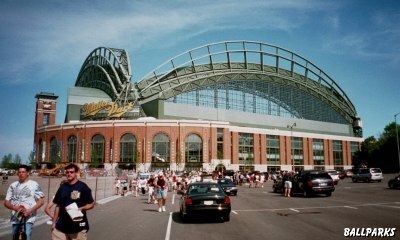 Miller Park was opened in 2001, built to replace Milwaukee County Stadium. The stadium was built with $310 million of public funds, drawing some controversy, and is the only sporting facility to have a fan-shaped retractable roof. Miller Park has a seating capacity of seating 41,900 and with standing room 43,000, which is 10,000 fewer seats than County Stadium. The park was to have opened a year earlier, but an accident during its construction, which resulted in the deaths of three workers, forced a year’s delay and $50 million to $75 million in damage. On July 14, 1999, the three men lost their lives when the Lampson “Big Blue” crane, one of the largest in the world, collapsed while trying to lift a 400 ton right field roof panel. A statue commemorating the men now stands between the home plate entrance to Miller Park and Helfaer Field.